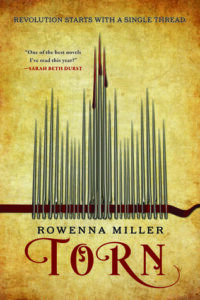 Torn spun me a web of intriguing world building and the start of a promising new series to read. Sophie is a dressmaker who has managed to open her own shop and lift herself and her brother, Kristos, out of poverty. Her reputation for beautiful ball gowns and discreetly-embroidered charms for luck, love, and protection secures her a commission from the royal family itself — and the commission earns her the attentions of a dashing but entirely unattainable duke. Meanwhile, Kristos rises to prominence in the growing anti-monarchist movement. Their worlds collide when the revolution’s shadow leader takes him hostage and demands that Sophie place a curse on the queen’s Midwinter costume — or Kristos will die at their hand. As the proletariat uprising comes to a violent climax, Sophie is torn: between her brother and the community of her birth, and her lover and the life she’s striven to build. Can I just say, first of all, that I’d like more books about seamstress/sewing? First I read The Prince and the Dressmaker and now this one? Like I’d like to continue the trend please. 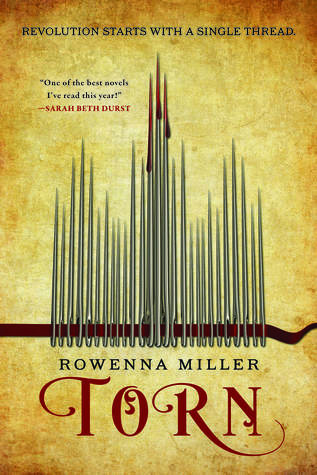 Regardless, if I had to sum up why I enjoyed Torn in two factors it would be: Sophie’s dilemma and the world building in terms of revolution and magic. Our main character, Sophie, captivated me. She was so intriguing because she is a seamstress (and as someone who can’t sew, this is already notable) but also has this interesting relationship with her culture/heritage. I loved that we were able to see the inside of her sewing shop. Sophie is just fascinating character – working the system and building the life she has from the ground up. She is hard working, determined, and doesn’t want to rock the boat. There’s a lot at stake for Sophie, which makes this revolution brewing in the background, and in her house, a dilemma for her. Does she side with the working class or protect her livelihood? Must she choose one or the other? Both sides lump her in with either/or and it puts in her awful situations. This is also reminiscent of her relationship to her heritage. While her parents are from a different country, one of magic, she was raised in a different culture. But she doesn’t feel wholly like either. She practices the magic that defines her as Other, but fits in with the traditions of the culture that mark her as part of the status quo – distanced from the struggles other immigrants face. The political unrest is brewing from page one and this sweeps you up. It’s like Les Miserables meets a Tamora Pierce book (hello Sandry!). No I didn’t hear the songs while I read this, nope, not at all – of course I did! While we feel a connection to our characters, Miller lovingly describes the magic for us in a way that leaves us with questions and answers. Part of this book involves the exploration of magic, where it comes from, and how it works. At the root of this also was almost like – how do you start a revolution? When is it too much? And how do you decide what you’ll do? A lot of the revolutions I’ve been seeing have started out with violence. So Torn is fantastic because it looks at how it evolves, takes on a life of its own, and changes with the people in charge. If any of this sounds like something you’re even remotely interested in, check out Torn on Goodreads. If you want books on sewing you HAVE to read The Red Ribbon by Lucy Adlington – I’m also adding this to my to-buy! Powerful women never get old to read about! Great review!